Can it be that this the most beautifully written, the most perfectly proportioned of anything Sartre has done will turn out to be his most beloved, or at any rate, most popular work? The phenomenal French sales suggest just that. If so, how ironic! 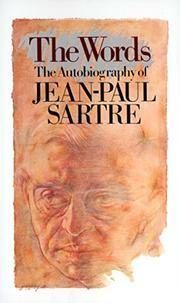 Sartre's reputation was built to a large degree on an iconoclastic opposition to his country's aesthetic tradition, on a campaign for literature in the thick of things. To be sure, an existential choice is presented, surprisingly paralleling that of Saint Genet and even the Baudelaire study, but unlike them the temper or tone is no longer engaged. Rather it's a blend of philosophical romanticism (echoes of Rimbaud's Les Poetes de sept ans) and of classical craftsmanship like Montaigne. The work- superficially a childhood remembrance ending in Sartre's eleventh year when his mother remarries- moves on many levels: as a purging of the past (he grew up a "nobody's son," an "object" without a father in a bourgeois never-never land); as a salvation hunt (he discovers the family library, a temple where words become substitutions for the sacramental, a "project" to replace his worn-out Christianity); lastly, and perhaps most importantly, as a fiction consciously imposed over fact (he recreates himself: a little ugly darling in a "movie," a hero accepting his "bastardy," his role to outwit circumstance). Thus both self-indictment and self-transcendence, the very apotheosis of a writer spitting in the face of "fate" or of its illusions. What a severe and subtle work, what self-exposure! And yet... isn't there a certain theatricality here, a superbly analytical temperament, not a cry, not a real confrontation? That a master wrote Les Mots is unquestionable, that he wrote from the heart is not.